Steinway & Sons, Year 1879, Model A-1 6'2" Brazilian Rosewood grand serial# 41137 - - - Status: Fully restored. In showroom. The Steinway A-1 6'2" 85-note grand was introduced in 1878, and is considered by many to be the first fully modern grand incorporating most of Steinway's distinctive inventions, including the sostenuto middle pedal, the tubular action frame with modern repetition wippens, duplex and triplex scaling to enhance treble harmonics, enabled by the "Capo D'Astro" or treble capo bar incorporated in in the stringplate. This instrument was built in the first full production year of this model, with the plate cast in September 1879 and original notations from Steinway employees inked in hidden locations, indicating that the instrument was completed in about November 1879. It has an elegant Brazilian Rosewood case with filigree music rack and decorative "barrel" legs and lyre. It has a number of unusual early design features, such as individual brass bridges for the front triplex scales in the high treble. This instrument showed no signs of any earlier major renovations other than restringing. An inscription on the soundboard show that the instrument was located in Chicago in the late 1800s, and inscriptions inside the keyslip show it was tuned about that time by "Prof. Benno Katthain" who was a noted piano tuner in Bay City, MI near the turn of the century. The piano was most recently located in California, and before restoration had deteriorated to nearly unplayable condition, with very corroded steel and overspun strings with very poor sound, sluggish and non-function action parts, and a cracked pinblock so that the instrument would not hold tuning properly. The case was remarkably well-preserved, with a fairly clear finish despite dirt, some minor veneer damage, and some apparent crazing or "alligatoring", and some scuffed and damaged sections on the legs and lyre. 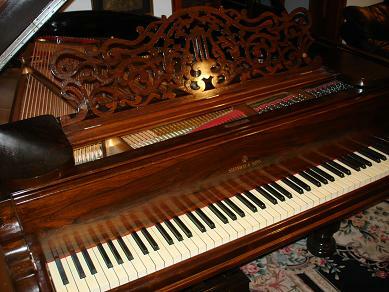 It has been completely restored at Historic Pianos in 2009, including case repair and refurbishing of the original finish using traditional finishing materials, restoring the gloss and clarity of the original finish without damaging the beautiful 130-year-old patina of the rosewood. The piano was fully rebuilt to like-new functional condition, with a new Bolduc pinblock, German #2/0 nickel-plated tuning pins, regilded and relettered stringplate, and complete repair of the original soundboard with antique spruce shims, with a combination of modern tools and traditional woodworking methods (such as using only hide glue, so that the soundboard retains the same crown and integrity it had when it was first built. The instrument was restrung with a custom set of high-quality bass strings, providing completely uniform sound production at the transitions between bass, tenor, and treble bridges and between monochord, bichord, trichord overspun and trichord steel strings. The original ivory keyboard was cleaned and damaged ivories were repaired, restoring the desirable feel, beauty, and elegance of the original high-quality ivory keytops. The action was completely regulated, including advanced key rebalancing for ideal uniformity of touch, giving a medium-to-light touch desired by the new owner. The original Steinway hammers were made of higher quality felt than any modern hammer made today--and showed no significant wear or loss of resiliency despite significant use over the past 130 years. So the original hammers were retained with minor reshaping and slight voicing, giving a rich, fairly bright tone still with the signature Steinway "growling" bass that the new owner (and most others who have played this instrument) strongly preferred to the darker, more muted tone of typical modern Steinways.